As it’s Non-fiction November, what a better way to celebrate than to review a second non-fiction book! I have been a big reader of true life survival stories, historical and modern for many years. I love the adventure, the fear, the instinct to survive and overcoming adversity, be it alone or with the help of others. It’s truly amazing what humans and animals can do when really put to the test. 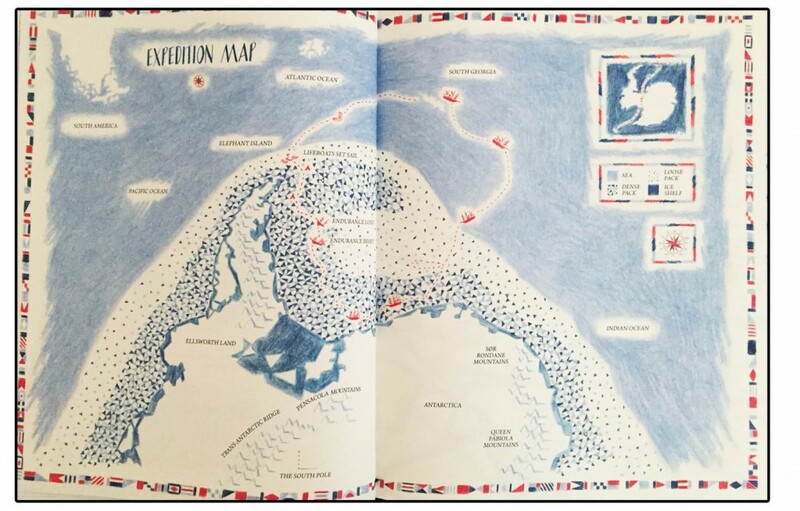 When I heard Shackleton’s Journey by William Grill was the 2015 winner of the CILIP Kate Greenaway Medal, I knew immediately that it must be something quite special. I am also quite a fan of Flying Eye books. Their publications seem to have a certain style and quality that is quite individual to them that I’ve become a bit of a fan. Clearly this was a book not to be missed. So, here it is, Shackleton’s Journey. it is another one of those gorgeously presented books, before you even open it, it has a feel of timeless quality. It oozes the cold desolate feel of the Antartic, with a clean white cover. In the centre is a gorgeous embossed compass style illustration containing many of the main features of this story. This is most certainly a keeper for the bookshelf. So for those who don’t know, Shackleton’s Journey tells the true story of Ernest Shackleton and his ill fated attempt to cross the vast south polar continent, Antarctica. With his crew of men, dogs, equipment and a trusty ship named Endurance they were confident of success. However, the Antarctic proved to be a formidable challenge, and unfortunately the ship Endurance was beaten down by the power of the ice and Shackleton and his crew must begin a hard fight for survival. 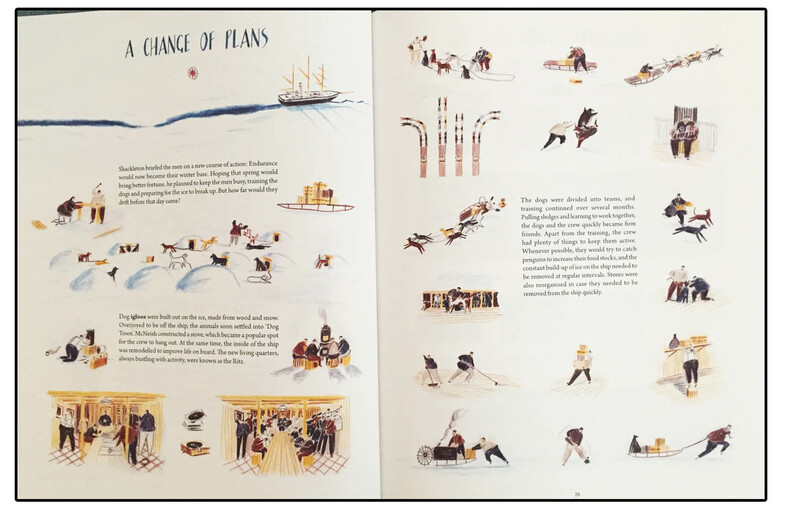 So the book takes from Shackleton’s early life (just the right of information here) to preparing for the journey, and immense amount of work this involved, and finally the journey itself. Each page is a gradual unfolding of the story, there is just so much to explore. Short snippets of text are informative and concise, making this book really accessible for less enthusiastic or struggling readers. The way the text is broken up with space and illustration prevents this book being too daunting. The illustrations by William Grill are very clever! They have a loose style with minimal definition, yet in turn they are incredibly detailed. William has, for example, illustrated every single one of the 99 dogs who embarked on the journey alongside a list of their names. It was a great way to pay respects to man’s best friend who sadly lost their lives on this expedition. Each crew member is pictured and even all the equipment has been drawn as tiny little illustrations, which children will love pouring over, and all gives weight to the scale of the journey. 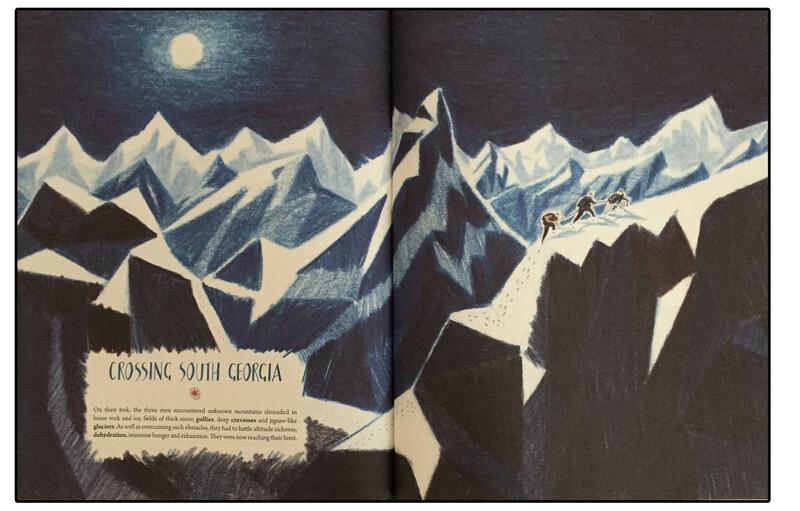 The most wonderful part of this book is how it jumps from very matter of fact, detailed text and illustrations of the story on one page, to a double spread of one huge haunting illustration, generally showing the landscapes and oceans. You’re sucked into a cold, desolate and harsh land and really get a feel for the struggle they endured. The addition of maps throughout the book charting the locations and routes just add to make this informative and interesting. It gives a sense of place. Shackleton’s Journey is not only a fascinating tale of adventure and history but it is an poignant one of comradeship and survival. On the last few pages we are also treated to a telling of the story of the Ross Party, a much less documented but equally risky and challenging trek. It was great to see some space dedicated to these brave adventurers too. Something I was once told by a teacher in school stuck with me … that only someone who understands a subject really well, is then able to simplify and re-teach it better than anyone. William Grill clearly knows his stuff and he has translated it into an ideal read for children and adults alike. 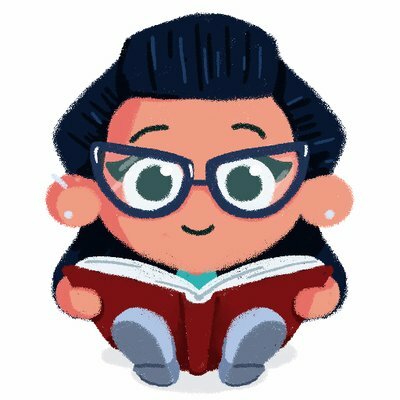 I can certainly see this book appealing to boys, and readings on Twitter about it seem to confirm this. 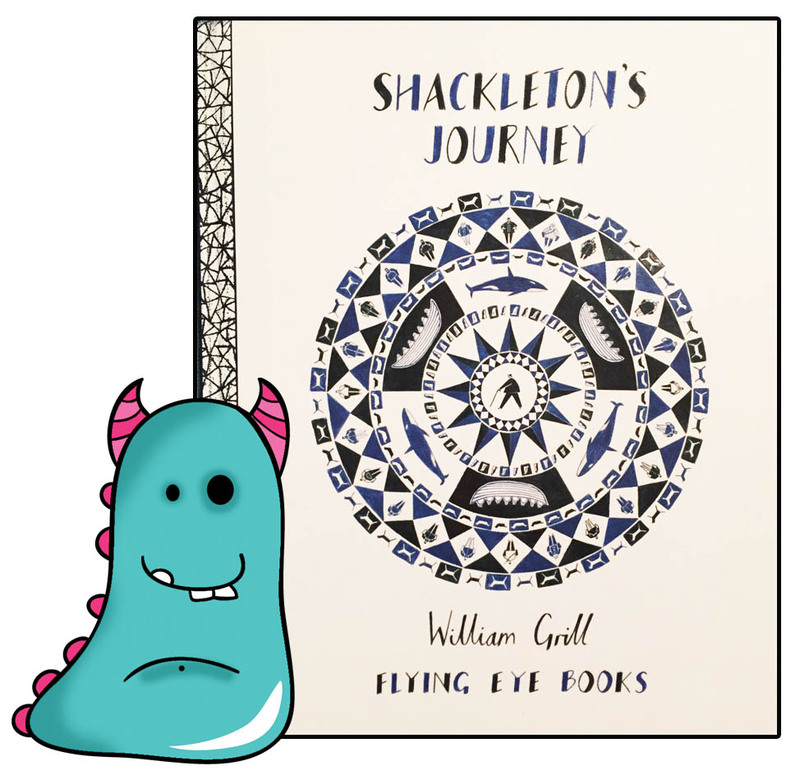 William Grill and Flying Eye Books have created a timeless classic in Shackleton’s Journey. 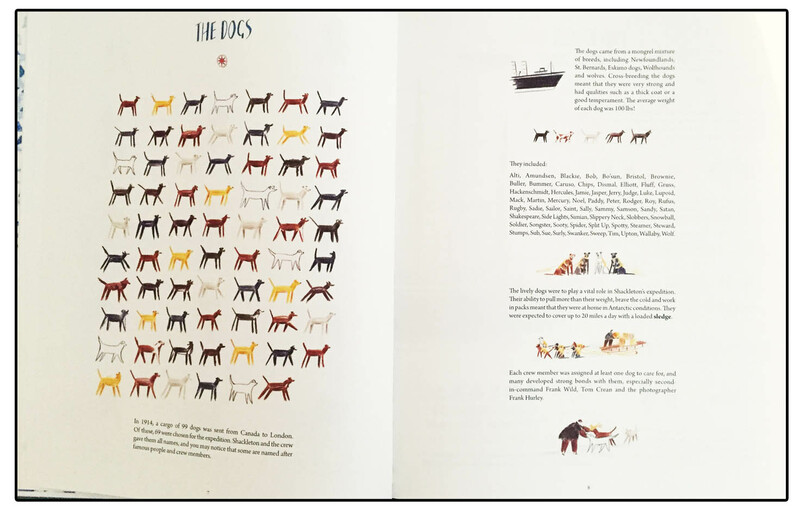 It is a very usable book in both home, school and library educational situations, but most of all it is just simply a beautiful example of storytelling. Flying Eye Books have recently released an activity book packed with puzzles, quizzes etc to accompany Shackleton’s Journey. 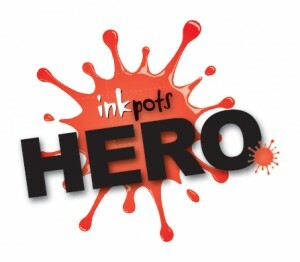 What a great idea and way to engage children more with a story. William Grill’s next book The Wolves of Currumpaw will be released in May 2016, and having seen some of the images from his sketch book for this, it looks even more sensational! 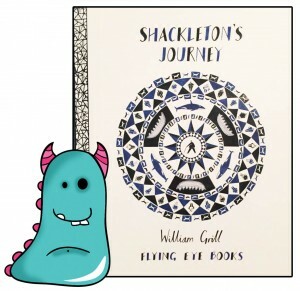 To find out more about William Grill and Flying Eye Books, visit the following pages. Thank you for sinking your teeth into this adventurous Book Monster Review.